Watch This offers movie recommendations inspired by new releases or premieres, or occasionally our own inscrutable whims. This week, we’re looking back on films that romantically pair real star couples. 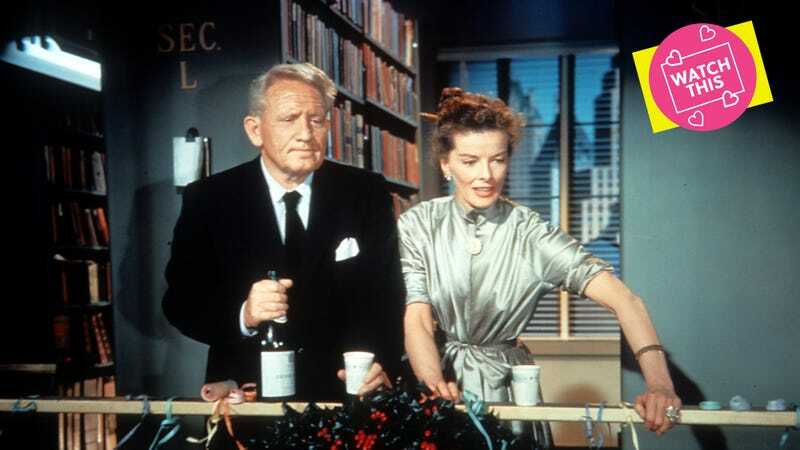 By the time Spencer Tracy and Katharine Hepburn starred in Desk Set, the real-life couple had made seven movies together since 1942; the 1957 film was their first in color and their last together until their swan song, 1969’s Guess Who’s Coming To Dinner. Sixty years after it premiered, Desk Set is a fascinating microcosm of not only 1950s office culture, but what Google was like before Google. Bunny Watson (Hepburn) runs a research department for the fictional Federal Broadcasting Company; the character was based on the real-life CBS librarian, but works here in NBC’s 30 Rock. Tracy’s Richard Sumner is a type of efficiency expert who is supposedly out to replace the real-life researchers with a giant computer he created, known as an “electronic brain.” Meanwhile, Bunny and her female office staff answer public queries like the names of Santa’s reindeer and recite The Song Of Hiawatha stanzas over the phone. The dolled-up secretaries and blandly suited men against a muted mid-century office palette, enjoying carefully scheduled coffee breaks and no shortage of workplace gossip, evoke the Mad Men era a few years before that show was even set. Drunken Christmas office parties and antiquated technology notwithstanding, the real fun in Desk Set is watching these two pros and longtime loves play off of each other for one of their final cinematic turns together. Sumner quizzes Bunny with some logic questions and is clearly dazzled by the common-sense functioning she brings to them, adding entirely new levels to pneumonic devices. When Bunny effortlessly tosses Sumner some insight, like the fact that he must live alone because his socks never match, you can spot the slightly bemused smile that Tracy must have thrown Hepburn’s way often in their life together. Tracy’s understated genius as an actor lives in the way he’s brave enough to highlight everyone else in his scenes, which just makes you appreciate him all the more. He wisely lets Hepburn take center stage here, and rightly so, as the real power of the corporation lies in the women who answer the phones, not the men who demand reports and jet off to meetings. We see a savvy network of office secretaries that discovers everything going on in the office before the men even realize what’s happening. Bunny has pined over buttoned-down executive Mike (Gig Young) for years—an unfulfilling relationship complicated by Sumner’s suddenly constant presence. Mike gets a VP promotion based on Bunny’s help on a financial report; he loves her for what she can do for him. Sumner loves her for her own effervescent brilliance. It’s not to say that Tracy doesn’t have any showboat moments in Desk Set: As Sumner dons some rain-soaked clothing and a soggy hat (in a bit of reportedly improv-ed slapstick), Hepburn falls out of her chair from laughter. As with all their films together, the two enjoyed nothing as much as playing off of each other, secure in the fact that they had found the perfect onscreen and offscreen equal—note the considerable smolder as a champagne-fueled Bunny interrogates Sumner about his past loves in the stacks. There’s barely even a kiss between the two in the movie: a peck on the cheek after a Christmas present, a brief clinch at the credits. For Hepburn and Tracy, the real chemistry was in the conversation, which went on unabated for the rest of their lives. Availability: Desk Set is available to rent or purchase through the major digital services, or can be obtained on DVD or Blu-ray from Amazon or your local video store/library.